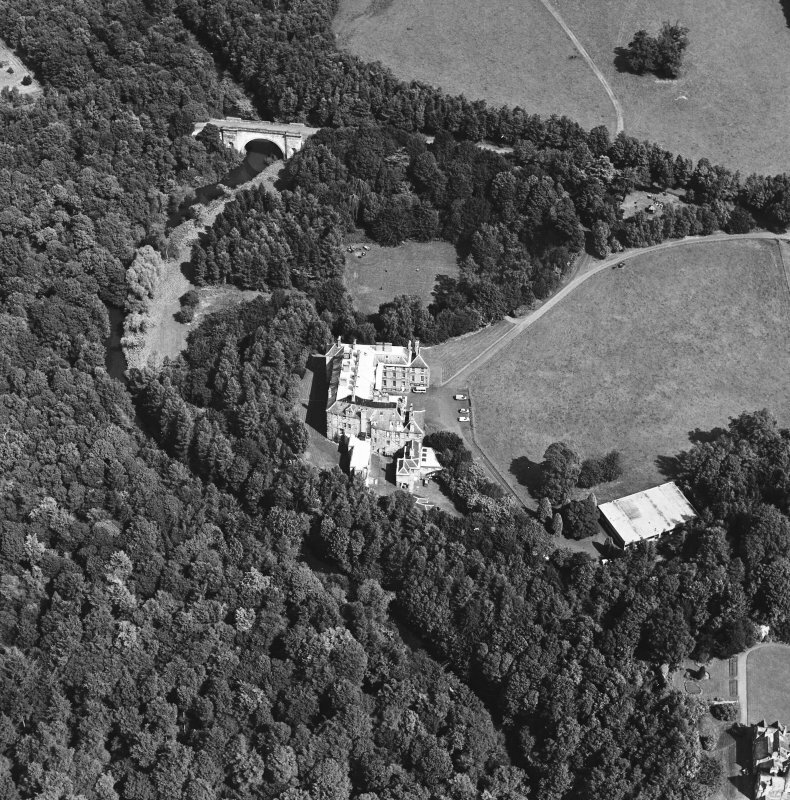 Oblique aerial view centred on the country house and garden with bridge adjacent, taken from the SE. 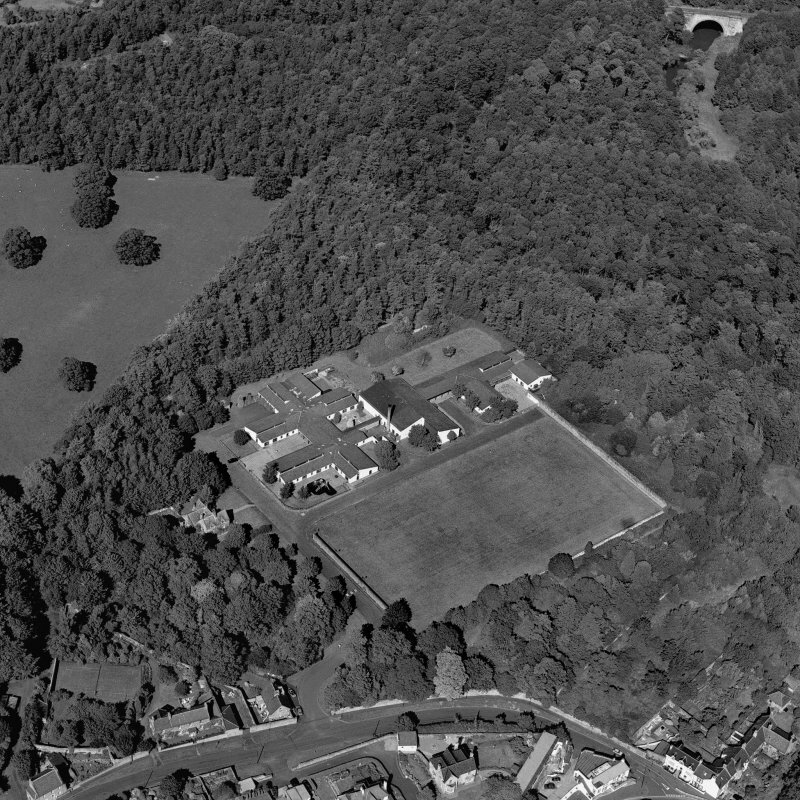 Oblique aerial view centred on the country house and garden with bridge adjacent, taken from the NE. 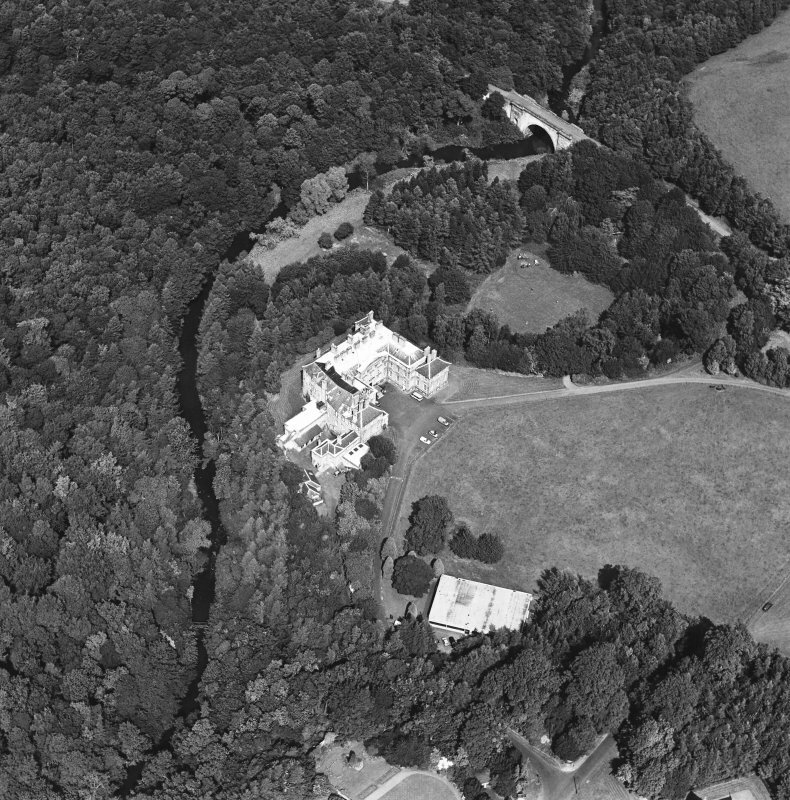 Oblique aerial view centred on the country house and garden with bridge adjacent, taken from the SSW. 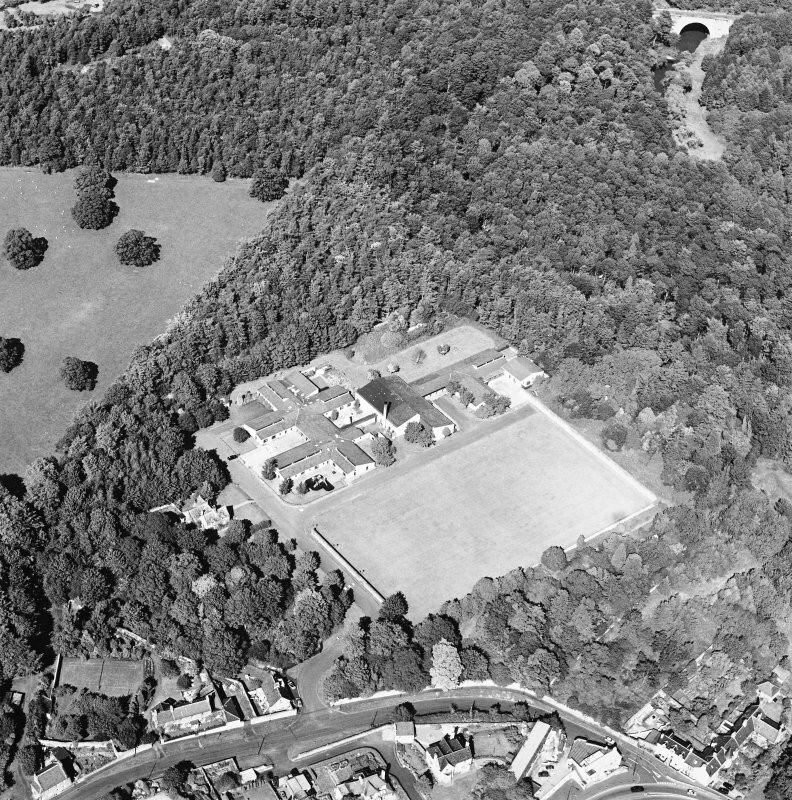 Dalkeith, Lugton Brae, oblique aerial view, taken from the SW, centred on school buildings. 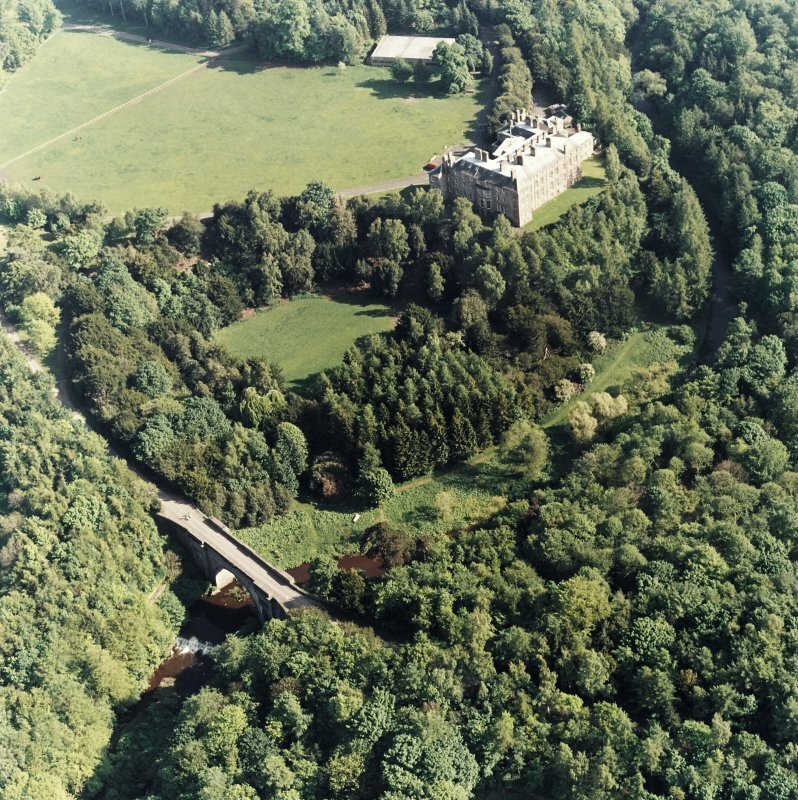 Montagu Bridge is visible in the top right-hand corner of the photograph. 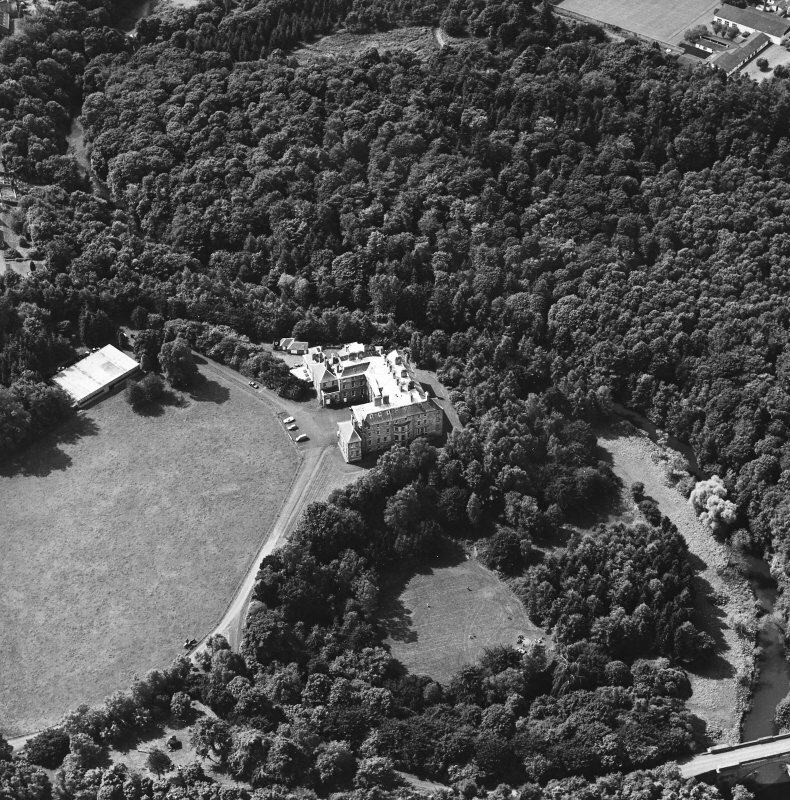 Oblique aerial view centred on the country house and garden with bridge adjacent, taken from the SSE. 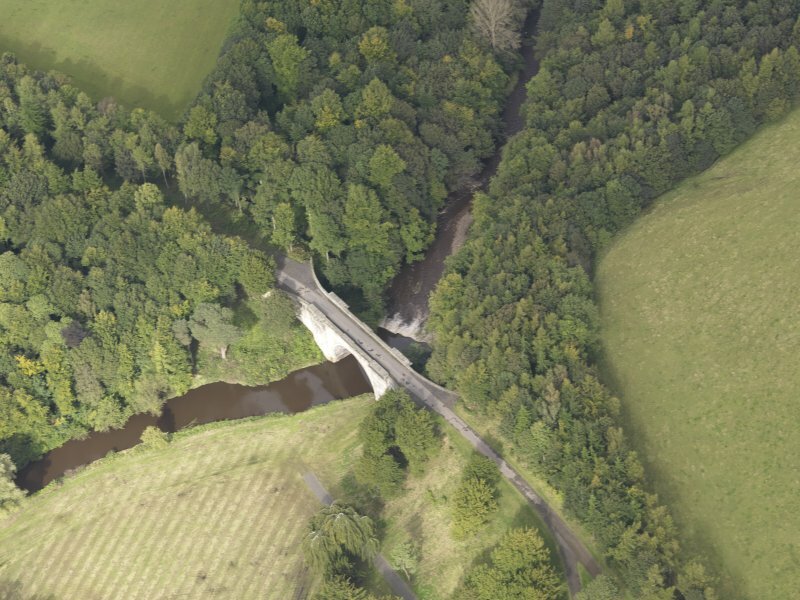 Oblique aerial view of Montague Bridge, looking to the N.
Oblique aerial view of Montague Bridge, looking to the SSE. 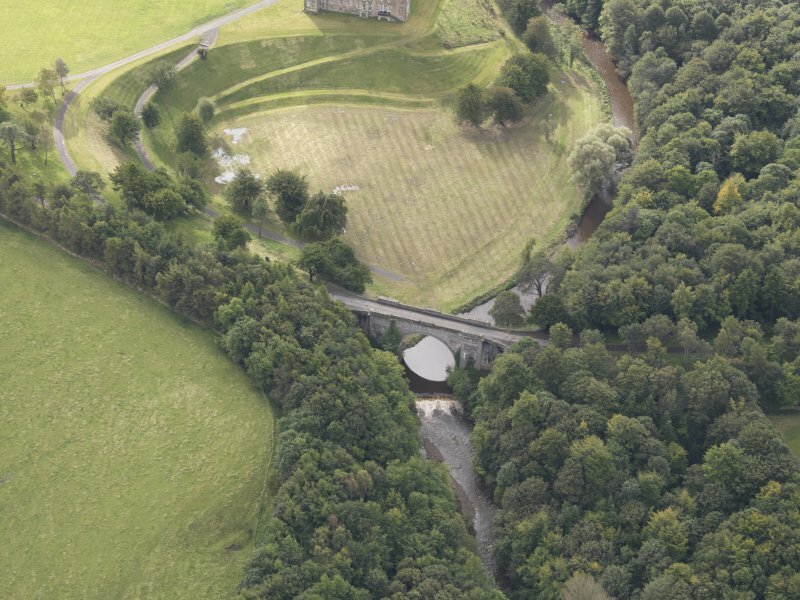 General oblique aerial view of Dalkeith House with adajacent Montague Bridge, looking to the S.
Oblique aerial view of Montague Bridge, looking to the NNW. 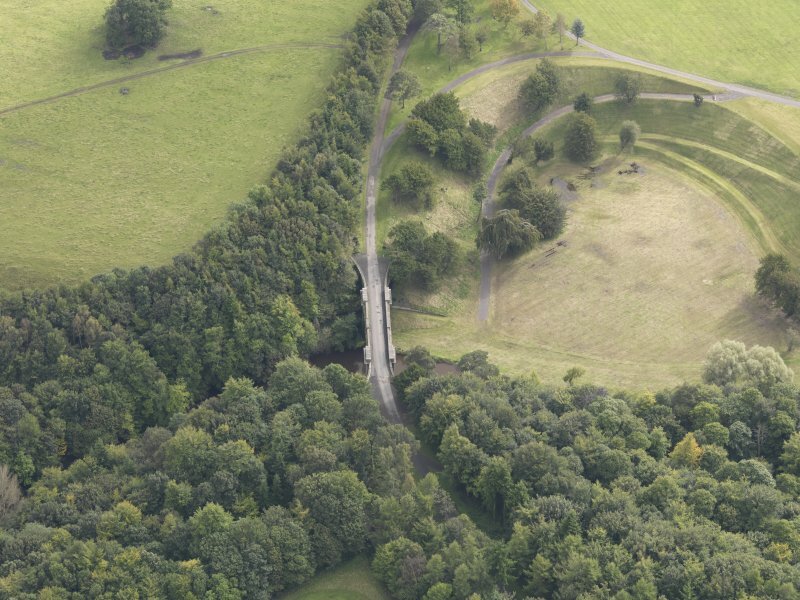 Oblique aerial view of Montague Bridge, looking to the NNE. 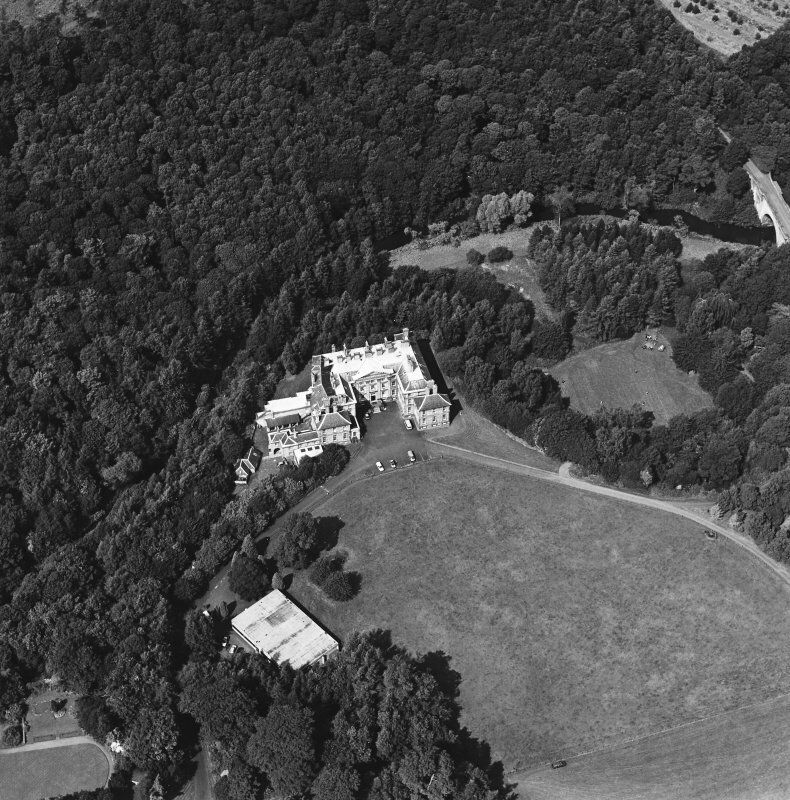 Oblique aerial view centred on the country house and garden with bridge adjacent, taken from the WSW. 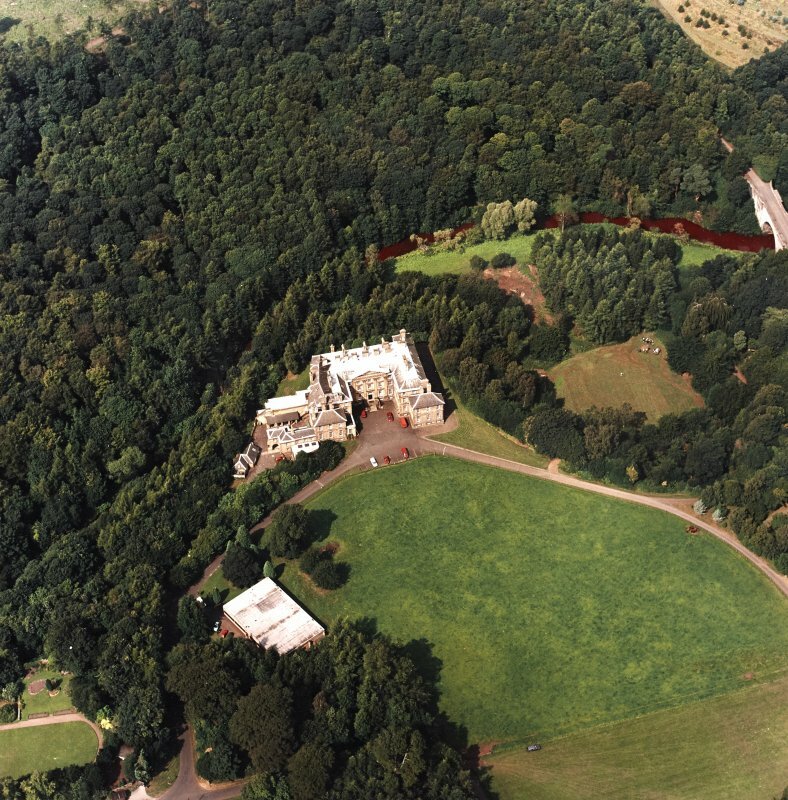 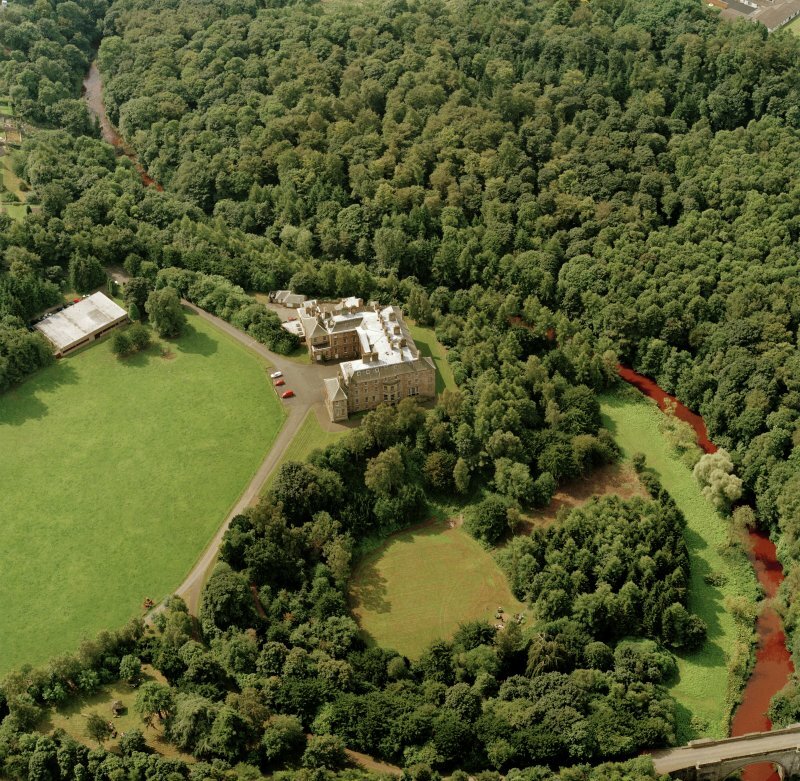 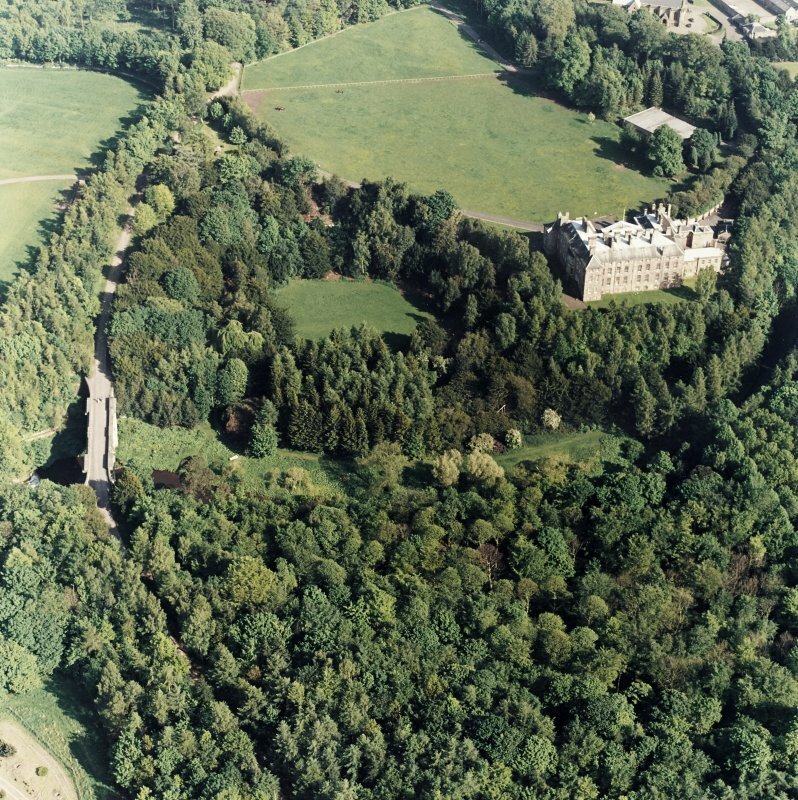 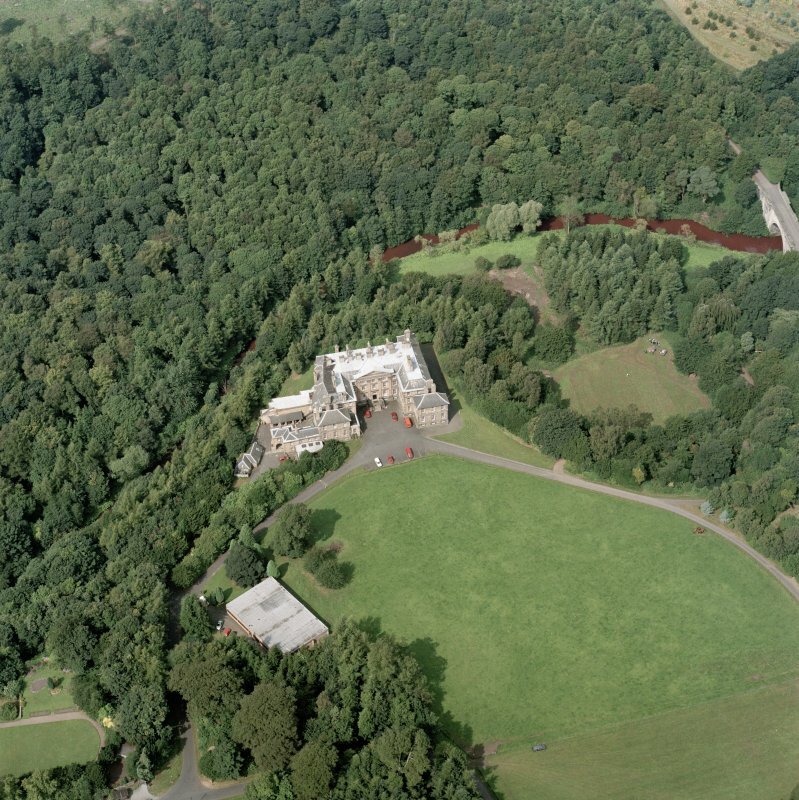 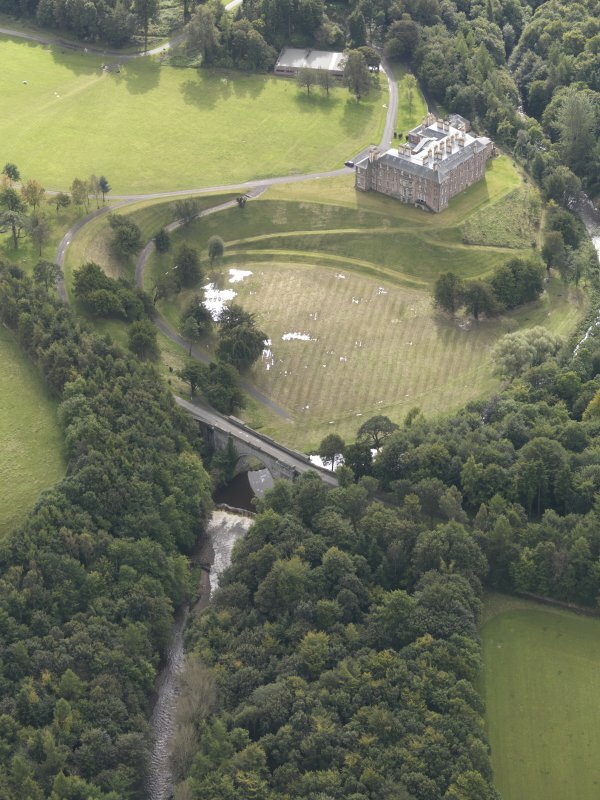 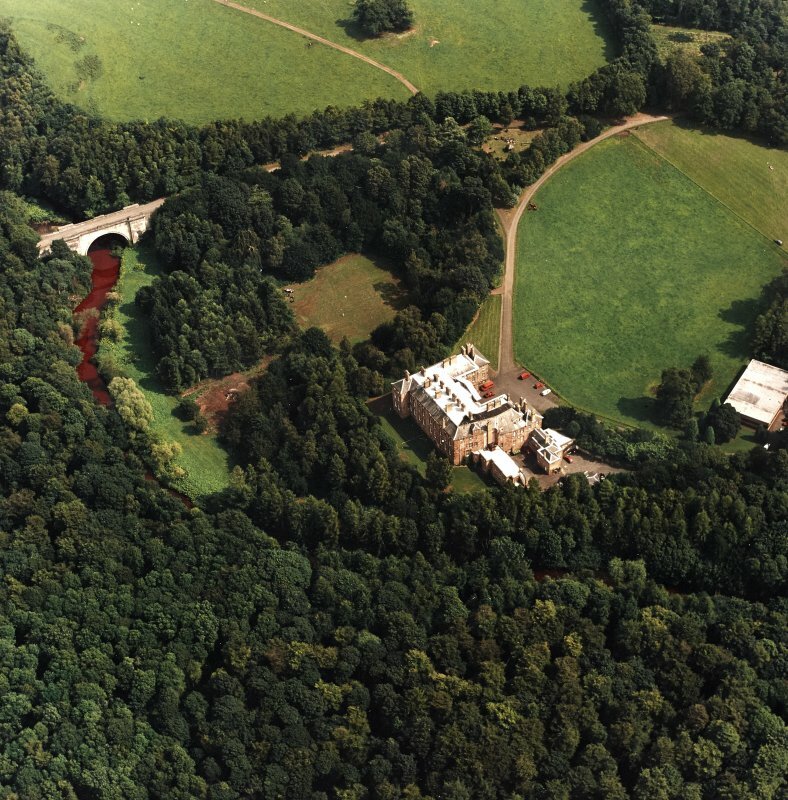 General oblique aerial view of Dalkeith House with adajacent Montague Bridge, looking to the SSW. 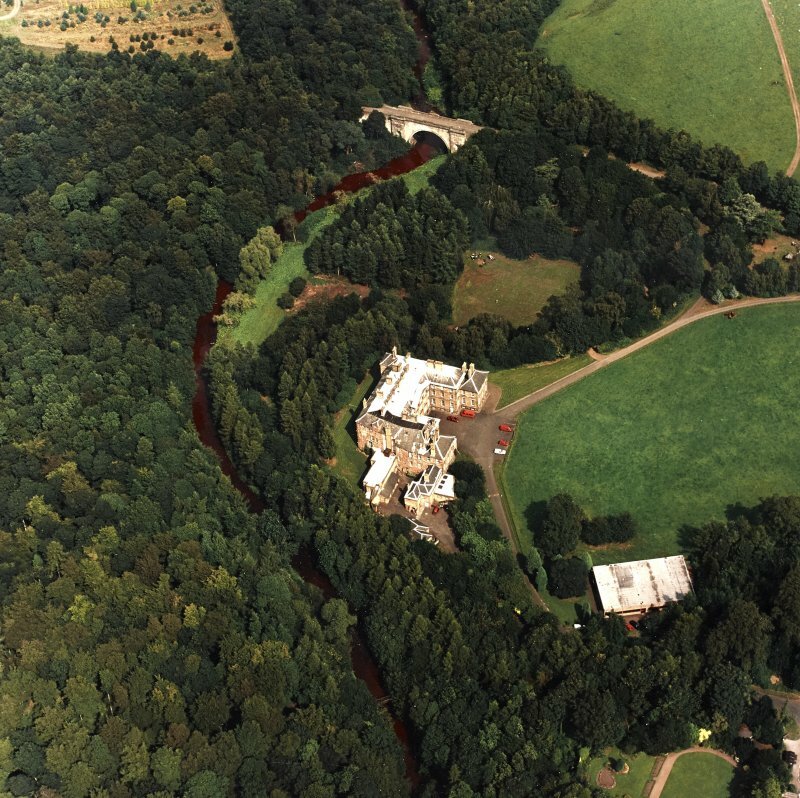 Drumlanrig Castle - Robert Adam - design for a bridge over the River Esk (framed watercolour). 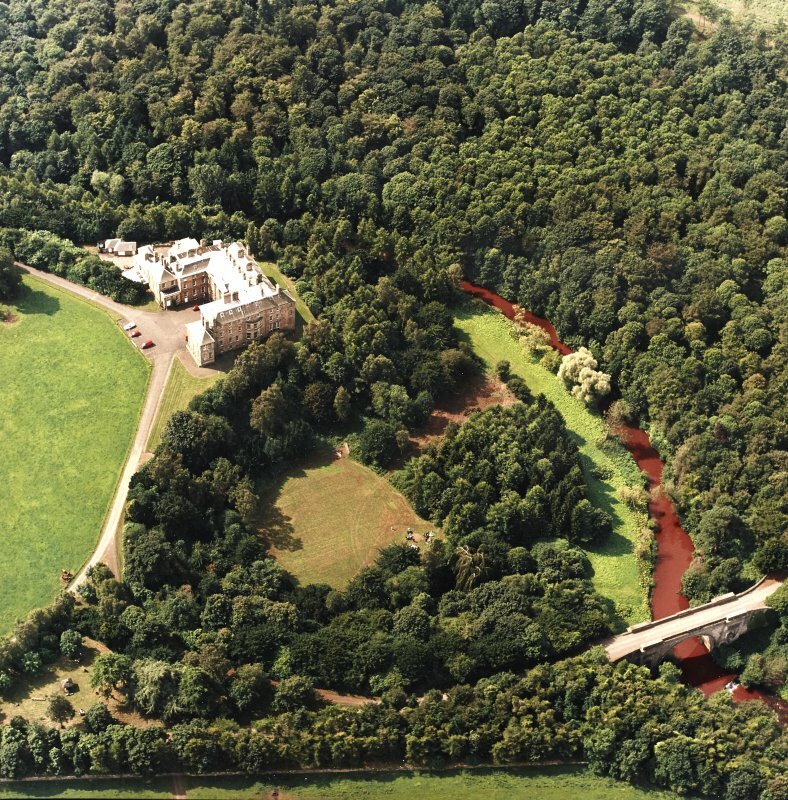 Nearby are the eighteenth-century (or possibly early nineteenth-century) classical laundry and laundry bridge. 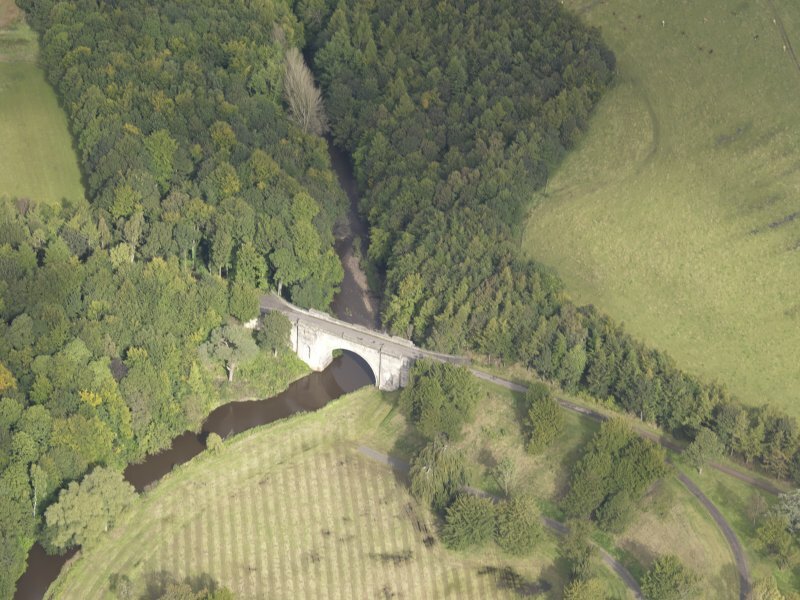 Montagu Bridge figure 23.D, spanning the North Esk, was designed by Robert Adam and constructed by his brother James in 1792. 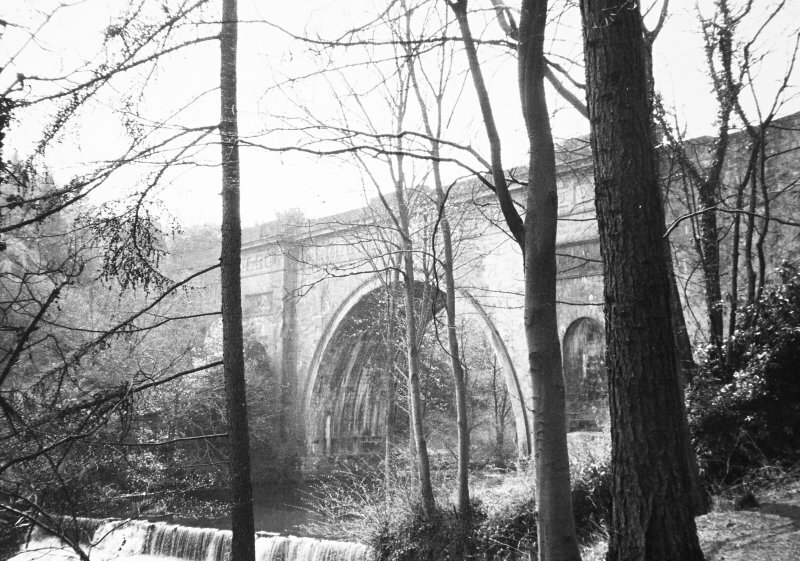 Three huge life-sized sculptures of stags were originally prominent features along the bridge parapet, but these were removed as they frightened the horses. 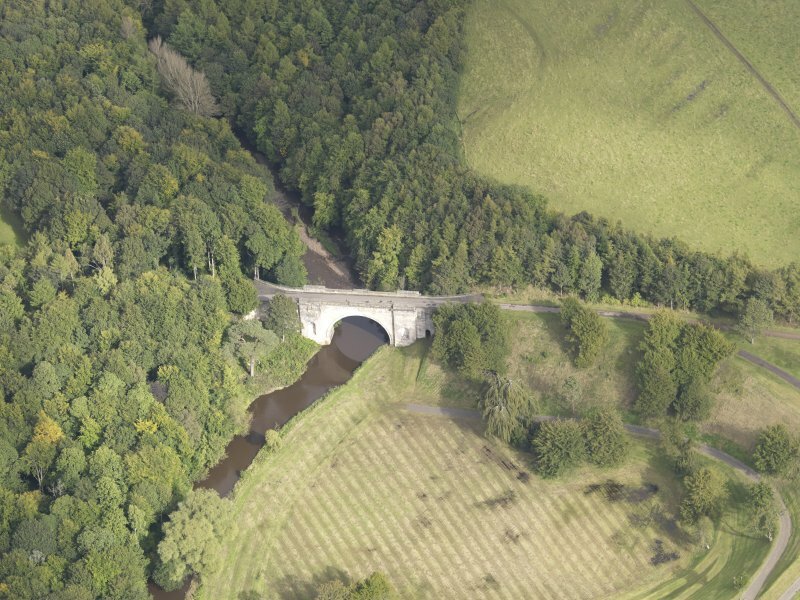 The bridge was erected by the third duke lo celebrate the inheritance by his wife of the Montagu estates. 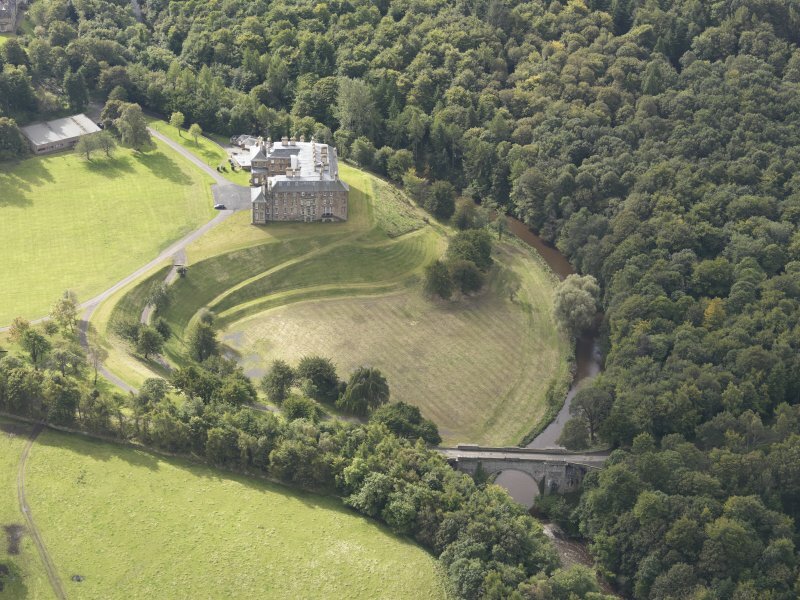 The Montagu Bridge crosses the river North Esk on the main approach to Dalkeith House, with a 70 ft semicircular arch span designed by Robert and James Adam and built in ca.1793.